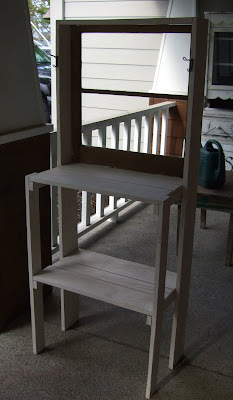 The other day I found this simple homemade potting stand/table on craigslist. I liked how it is a smaller size and thought it would make a nice display piece for shows. It was cute as is, but I decided to give it a coat of creamy white paint and a couple vintage screw in hooks. Now I'm loving it and can't wait to use it to display my junk/awesome stuff at Farm Chicks. Have been having a good time visiting with friends and my BIL this week. Not getting a lot of projects done, but I still have about a month left and I'm feeling pretty good about what I've accomplished so far. Thought I would show you a picture of the dogwood I got for Mother's Day last year. I love the salmony pink flowers on this one. Also want to show you my clematis in bloom. This one has sweet smaller pink flowers and is called "Elizabeth" which has a special meaning to me as that is my daughter's name. I love how it's growing kind of wild over the gate. Will be heading to Barn House this Saturday for the season opener. I hope to see you there! Wish I had one of those benches...it is awesome! I will see you at Barn House. I love your dogwood and clematis. I love your little potting bench Lisa... they always look SO cute fixed up. The clematis is SO pretty!! I love this time of year so much. Have a great weekend. I can't believe I've never been to the Barn House. It's my goal. I've got a brown thumb so I don't pot plants, but I would really like that potting bench to display the flowers my hubs grows for me. I sure hope our weather starts to perk up a bit. I know the Northwest is suppose to supply us with lots of rain, but there's just something wrong with running the heater at this time of the year! I'm sooooo excited to see you and all your crap.ooops I mean really cool stuff at Farm Chicks! I'm still working on getting down to Barn House this weekend. You know how everybody wants to come to Texas...well, I want to come to the Barn House and Monticello! I wish I could get clematis to grow, but it just won't for me and I've tried everything. That bench is very cool, I love it. It will be perfect for displays. 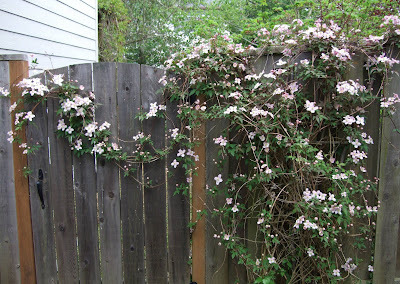 Love the Dogwood and Clematis, they are gorgeous. Have fun at the Barn House. I can't believe all the good stuff you find on craig's list...you have the knack with that site. Have fun at barnhouse...I can't make this one. 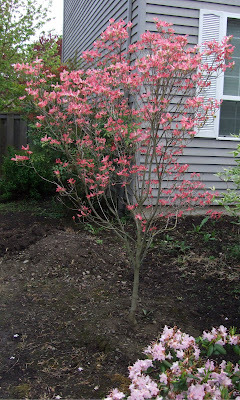 This is the second time that I have seen the dogwood tree on a blog, they are such beautiful trees. I am trying to see if I can obtain one from my local garden centre as I am so taken by it's beauty! Your blooms are beautiful! Cute bench..don't you just love Craigs List? You can find some real bargains on there. Your potting table makeover looks amazing...Love it!!! Your clematis is just stunning..Mine died last year! I need to buy a new one..